Christopher Adebayo Ojo, SAN is a former Attorney General of the Federal Republic of Nigeria. As such, he is also a past head of the Nigerian Federal Ministry of Justice. He is a legal practitioner and is licensed to practice in Nigeria, England and Wales. Chief Bayo Ojo hails from Ife-Ijumu, Kogi State, in central Nigeria. He had his primary school education in Maiduguri and Kaduna and his post-primary education at Zaria in Kaduna State. He worked briefly as a civil servant in Ilorin, Kwara State, before he proceeded to the University of Lagos where he obtained a Bachelor's Degree in Law in June 1977. Chief also did his LLM at the world-acclaimed London School of Economics and Political Science. He was former Head of Chamber, Oniyangi & Co. and founded Bayo Ojo & Co. in 1986. Elevated to the prestigious rank of Senior Advocate of Nigeria (SAN) in 1999, he was elected President of the Nigeria Bar Association (NBA) in 2004. 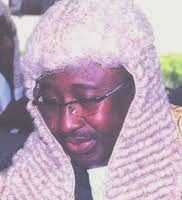 Subsequently, he was appointed Attorney General and Minister of Justice by President Olusegun Obasanjo. During his term as Attorney-General, he regularly appeared in court personally to argue cases on behalf of the government. Previous attorneys-general had mostly preferred to engage lawyers in private practice to appear for the government. He was noted for his brilliant efforts in decongesting Nigerian prisons by engaging lawyers in private practice to defend various individuals who were being held by the state without trial. As Attorney General and Minister of Justice, he also undertook numerous reforms in the Justice sector including the development of eight critical bills. In addition, he reformed all the investment laws in Nigeria. He also advised on the exit of Nigeria from foreign debts owed to the London and Paris Clubs. Regarded as one of the leading lights of Arbitration and ADR in Africa, Chief Bayo Ojo, SAN is Africa's representative at the Board of Trustees of the Chartered Institute of Arbitrators, London. I was opportune to meet Chief Bayo Ojo at the Esq. Arbitration International School held in Lagos and I was amazed at his humility and grace. We talked about policy making in Nigeria and how there was a dire need for credible and sound policy makers in the country. He was also gracious enough to give me practice tips and career advice.